By 2019, nearly half the calls made to cell phones will be fraudulent, claims a recent report by First Orion, a phone and data transparency solution provider. This is a huge increase. In 2017, about 4% of cell phone calls were scammy. By 2018, that number had grown to almost 30%. And the upward trend continues, thanks in part to new dirty tricks like “neighborhood spoofing”, in which a scammer spoofs the area code and prefix of the caller dialed, to increase the likelihood of getting an answer. It’s pernicious, it’s annoying, and it seems like the bad guys are always one step ahead of the technological solutions deployed to end their schemes. Case in point: third-party blocking apps only blacklist known spam numbers. While this is useful (and while the companies offering this service update the master list of bogus numbers regularly), these apps won’t protect you from spoofed calls, which generally originate from legitimate phone numbers that have been temporarily taken over by scammers. The good news is that phone manufacturers and cellular service providers, in collaboration with government regulators and third-party privacy and security companies, are rolling out new tools to help you keep your phone as free of spam as possible. First, register your number with the Federal Trade Commission’s Do Not Call list. You’ll need to fill out some information and reply to a confirmation email to complete the process. This will also allow you to report spam numbers directly to the FTC, which helps everyone get rid of these annoyances. Reporting unwanted text messages is easier – just forward them to 7726 (SPAM). Most US carriers participate in this program, which uses the submitted information to blacklist numbers and to try to block future spammers. Second, use your phone’s built-in capabilities to block as many known spammers as you can. On Android devices, open the Phone app and select the number. Tap “More” and choose whether to block calls, block messages, or block everything originating from that number. You can also add numbers manually by going to Phone > More > Settings > Call Blocking > Block List. On iPhone, go to Phone > Recent > Info > Block This Caller. At the confirmation message, choose “Block This Contact”. Your cellular carrier also has services in place to help you win (or at least try to tie!) this frustrating game of spammer whack-a-mole. Note, however, that these services are generally NOT free. AT&T has a support page with tips on how to block unwanted calls and on how to use their two blocking services, Call Protect and Smart Limits. T-Mobile has a suite of services available to subscribers. You can access more details of their ScamID, ScamBlock, and NameBlock services. Sprint offers spam protection through its MySprint app. Verizon Wireless offers its subscribers a service called SmartFamily. 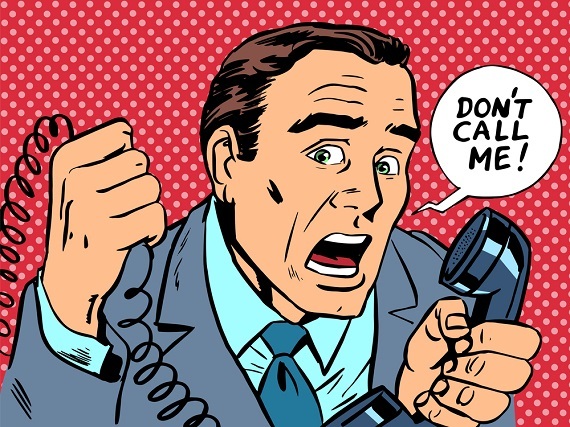 Combining the power of the federal Do Not Call List with the technology sitting on your cell phone carrier’s servers with the software built into your phone can help you stem the tide of scammy calls. There are also third-party apps available for all models of smartphones that will help you block unwanted calls, blacklist scam callers, and cut down on the annoyance of robocalls. Again, most of these are not free (except Hiya), and almost all require a renewing subscription. But if you’re inundated with these calls, they may very well be worth it. Check out apps like Hiya, Nomorobo, Robokiller, and Truecaller. Or, if you are an iPhone user, you can deploy the nuclear option: go to Settings > Do Not Disturb > Allow Calls From > All Contacts. Then turn on Do Not Disturb. Permanently. Now you’ll only receive calls from numbers already in your contacts. Everyone else will be blocked. This is great, until it isn’t – you probably want that call about the new job to get through, and you never know when you’ll get an emergency call from an unknown number. So while not perfect, this technique will absolutely still your squalling iPhone if needed. And if all else fails, you can just let those unrecognized calls roll right over to voicemail.